When I was a little girl M& M’s and Snickers were rare treats, the only way to get them was when my grandmother would visit the United States – the States like we call it in Trinidad. Even then there wasn’t a guarantee she would bring us back of the special treats you could only get there. Yes we had our own Trinidad, or I guess Caribbean versions of these candies from Charles Candy company. Don’t get me wrong I enjoyed those treats and especially now that I live in the States I would love to have them but back then when that was my only option I longed for M&M’s and Snickers. Another great thing about living in Trinidad were the homemade treats. My mother baked fresh bread every week, sweet bread, cassava pone, sugar cake, beef pies, tarts, guava cheese, tamarind balls, sweet mango, I could go on and on about all the different things she made when we were kids and the items we in season. Again all things I couldn’t appreciate back then and now that I am an adult with my own family I would love to share that culture with them. When I was pregnant with my fourth child I was craving fudge for some odd reason. There’s a candy shop close to where we live and they sell fudge I would go there and purchase fudge all the time but I just wasn’t quite the same as the fudge I grew up eating in Trinidad. Last summer I wanted some fudge badly and I just didn’t want the fudge from the store. I even tried multiple recipes I found on Pinterest for microwave fudge but that didn’t cut it. Eventually I found a base recipe on the Carnation Condensed Milk UK website that I figured would work. I immediately gave it a try, and with lots of trial and error I finally got a fudge that reminds me of my childhood in Trinidad. Up making fudge for my sister. One of road blocks to making Trinidad fudge is the mixing. I can remember my mom mixing up the fudge by hand with a wooden spoon. It could take up to an hour to get it done. Honestly I don’t know how she did it at least once a month. Whipping the fudge by hand is a very tedious task because if you do it too slowly it will turn into caramel and over mixing results in a crumbly fudge. I use my stand mixer with the paddle attachment to mix my fudge after boiling it on the stove. I mix is on low for about five minutes and then to medium for another ten to fifteen minutes depending on how firm I want my fudge. When using a stand mixer make sure you don’t keep it on a low-speed setting because it won’t get enough air and just be a caramel consistency. It does boil down to personal preference. I like my fudge firm with a smooth consistency. Any thing I like about this fudge is the use of Coconut Milk. It really reminds me of home when I make the fudge using ingredients my mother would use. Of course my mom made her own coconut milk and mines comes in a can but either way it gives the fudge a whole new flavor profile. You can also just use evaporated milk in place of coconut milk if you prefer. I don’t know how to eyeball the proper boiling point for fudge like my mother would do when making it in Trinidad so I use a candy thermometer to make sure I have to proper boil I need. You’ll also need a non-stick stock pot, something that won’t make your fudge mixture burn easily or stick to the pot. Make sure it’s a deep enough pot so in case of any splatter you don’t get burned. Be very careful when transferring from the pot to the bowl. I burned my finger really badly once with the hot mixture. 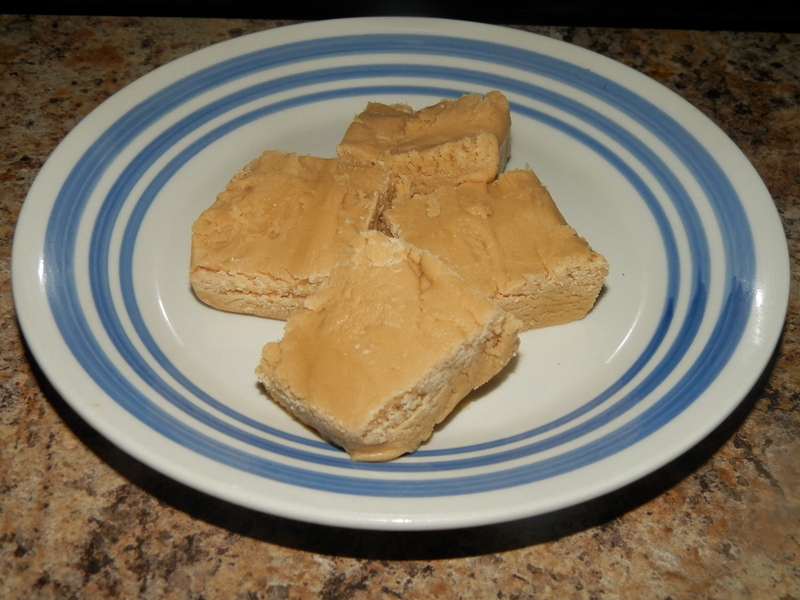 I hope you give this fudge a try to if you’re from Trinidad and you make it be sure to leave a comment letting me know how it turned out for you. Remember it can take some trail and error but it’s so worth it in the long run. 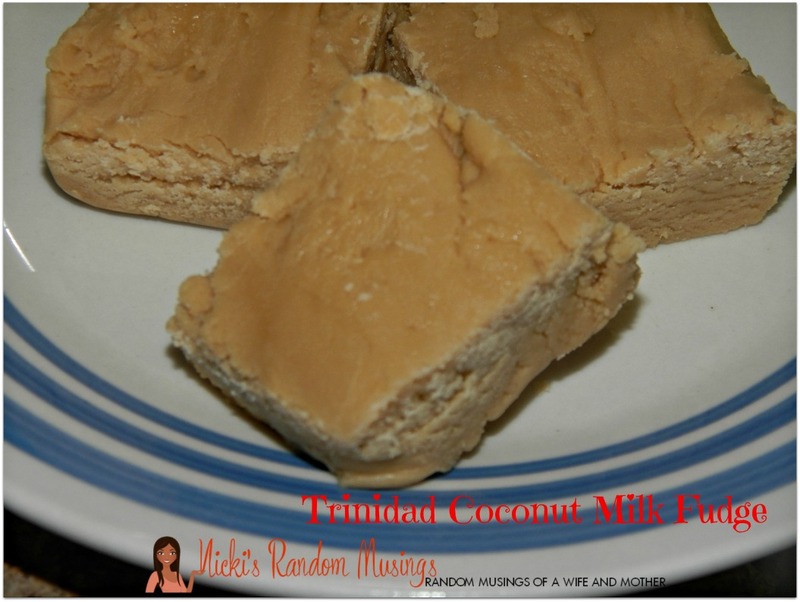 This easy fudge recipe is a great base for fudge that you would find in Trinidad. I use coconut milk to bring the Caribbean flavor and my stand mixer to make the steps easier. You will need a square brownie pan 9x11 lined with parchment paper or lightly greased to pour the fudge in when it time for it to set. It takes trial and error so stick closely to the steps if you’re new to making fudge – once get the hang of it your results will be out of this world! Place the ingredients into a large non-stick saucepan and melt over a low heat, stirring until the sugar dissolves. Bring to the boil then simmer for 15-20 minutes, stirring continuously and scraping the base of the pan. Take care while the mixture boils and during stirring as the fudge will be VERY hot! To test its ready drop a little of the mixture into a jug of ice-cold water. A soft ball of fudge should form. Or check with a sugar thermometer if you have one (approx 118°C). Remove from the heat and beat the fudge until very thick and starting to set (about 10 - 15 minutes). You'll know when you get to the consistency you want. You can also use a stand mixer like I do and not mix it with your hand.